napped in our floats, and were as Lazy as we could possibly be. It was another perfect day! Speaking of autumn... It won't be long now before our Trees begin to turn pretty colors! As sad as I am to see Summer go... Stunning fall foliage is something to look forward to! 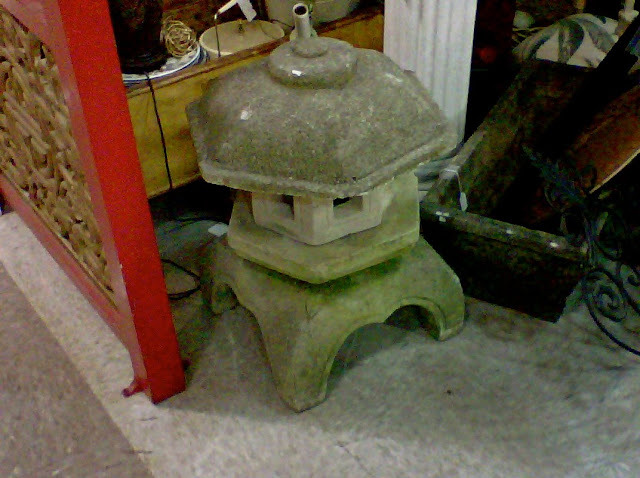 lantern at Antiques Marketplace in Greensboro? be joining the one she sold us last year, she agreed that we must have it for $100! garden - But I do Love it as much as I thought I would! Right here in our Garden! I just hurt my blonde head trying to DIVE~the~HECK into that POOL! I am desperate for a POOL day! And your toes~eees looks so GOOD! Is it cooling off already down there? It's supposed to be 85 here tomorrow! I plan on doing some floating myself with a mimosa. Your lantern is lovely too! Such an oasis! If my garden looked as beautiful as yours I would not leave the house either! We worked in our yard all day to get it looking a little better. Oh your pool pics are perfect for the past weekend... Here it was picture perfect, but there are some leaves FALLing! Love the pic with the leaf in the pool... great shot! The garden lantern is soo perfect too! *Enjoy the new autumn breezes! I got up, got ready, left the house early so I could stop by the post office only to find out that they were closed. duh! I got to work early since I couldn't go in the post office, waited outside and talked on the phone wasting away 20 minutes of my precious time til I was needed at work, only to find out that no one was there. Apparently, I got the day off for the holiday but no one bothered to tell me! I would have rather been in your pool. BTW, do you always carry your camera around with you in the pool? ha ha!